A large number of climbing accessories revolve around protection and additional security. Handling ropes creates friction and in turn heat. Gloves help to protect the hands. Depending on the model, they are made of abrasion-resistant plastic or leather for long-lasting protection and may come with hook-and-loop fasteners. Belay gloves tend to be tight-fitting and rubberized to provide extraordinary grip. Via ferratas take their toll on the hands and blisters can appear after a hard day's climbing. Black Diamond has a large selection of via ferrata gloves for this reason. These range from flexible gloves with a mitten hood and fingerless leather gloves to thick winter gloves for winter via ferrata ascents. The gloves not only protect the palms against damage caused by pressure points and loose iron parts, the outer material also protects against the weather. Crack climbing gloves are a very specialized type of glove. This climbing technique requires you to regularly wedge your hands into cracks, so the primary function of the gloves is to protect the back of the hand against bruising and abrasions. Crack climbing gloves tend to be finger-free, so that climbing normal routes with the gloves is also possible. The gloves, however, are not suitable for big grips or highly abrasive slopes. 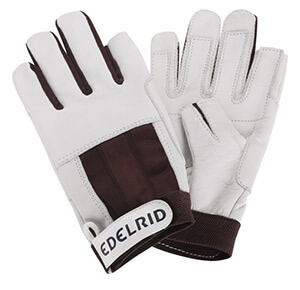 Many of the gloves are all-rounders which are useful for more than one discipline. However, you should think about what you want the gloves for before getting yourself a pair, because although versatile, many gloves boast their own individual innovations. The only real breakaway from standard climbing gloves are crack climbing gloves, which are specifically designed for one thing.